These are beautifully made dolls which are little finger size. 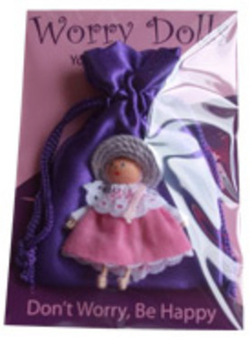 South American legend says: tell your worries to a Worry Doll before you go to bed. Put them in their bag and under your pillow and in the morning all your worries have gone. Children love them. Cannot say which colour you will get but they are all lovely colours. Size of a little finger. Handmade.